If you’re interested in using WordPress to set up a website or even if you have no idea what WordPress is but you want a website, the videos below were created by Bluehost hosting to show you how to use a hosting account through Bluehost to easily setup your website using WordPress. Check out the videos below and see how easy it is. Special Offer – I’ll Install WordPress For You! If you sign up for Bluehost hosting using the link below, I’ll set up WordPress on your website for you free of charge and install a free premium WordPress theme of your choice. 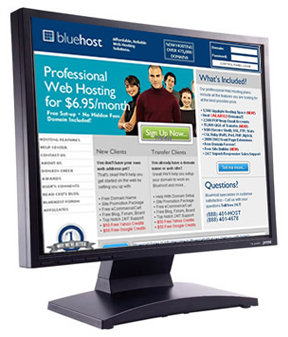 To get a Bluehost hosting account, click here. Then contact me and let me know you want help installing WordPress. You can also try to install it yourself following the instructions in Video 2 below. If you don’t have a Bluehost account, click the banner below. Pretty Easy – Or is it? These videos make it look pretty easy and it is… for most people. However, I know there are a lot of people out there that want a website but don’t want to create it or manage it themselves. Even though these WordPress Tutorial Videos from Bluehost are very helpful, there’s a lot more involved to create a full website, make it look professional, and keep it updated. If you’re interested in paying someone for your website, whether it’s for a small business or just a personal website, you may be interested in my Affordable Website Package that uses WordPress and professionally designed WordPress themes.